Autonomous driving: If you dare! 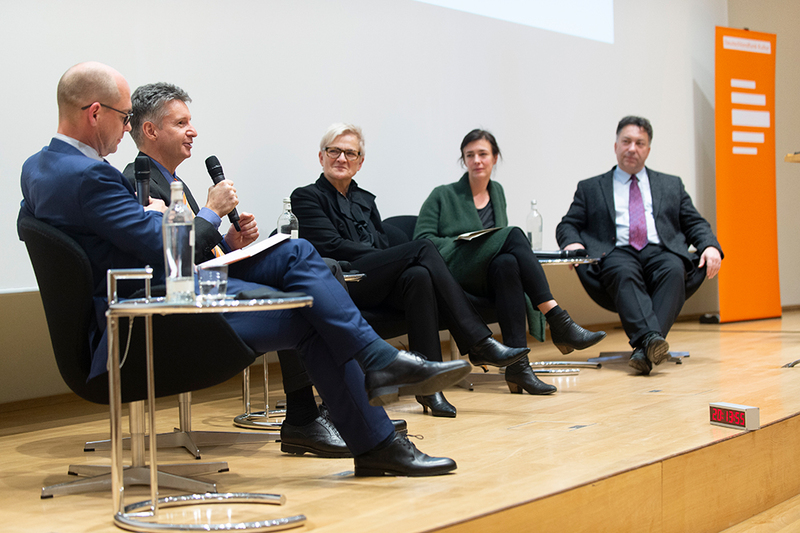 An exchange in the ethics debate surrounding technical progress: Self-driving vehicles was the topic of a panel discussion at the Herrenhäuser Forum held on January 15, 2019. When Elon Musk was once asked when the time would come for politics to ban autonomous driving, he asked back when the time would come for politics to finally ban humans from driving. 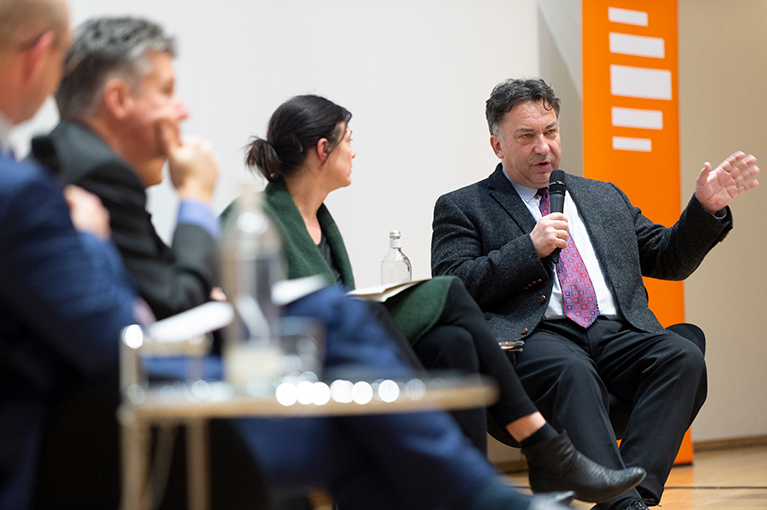 His quip was prompted by the current statistics on road deaths – caused by human drivers, mind you: In Germany alone, there are over 3,000 deaths a year from car accidents, confirmed lawyer Eric Hilgendorf during the Herrenhäuser Forum "Autonomous driving - where are we heading?" (in German only: Herrenhäuser Forum "Autonomes Fahren - wohin steuern wir?") 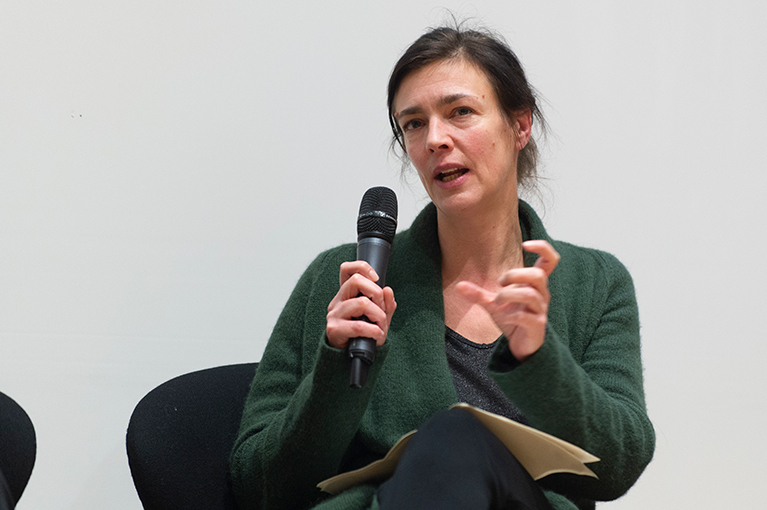 held in cooperation with Deutschlandfunk Kultur. The auditorium at Herrenhausen Palace in Hanover was packed full. Hilgendorf, a criminal lawyer and expert for robot law at the University of Würzburg, was of the opinion that the advent of autonomous vehicles would translate into fewer accidents in road traffic, since they could minimize the risk of human failure at the wheel. The introduction of the autonomous car would therefore first and foremost mean more safety for everyone. But when exactly does the safe state occur in a situation where autonomous cars "glide" through traffic alongside "normal" cars driven by such fallible humans? 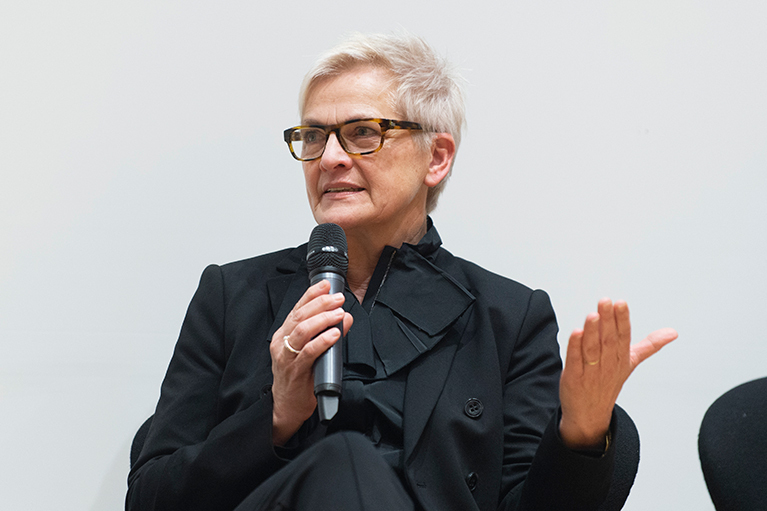 The panel consisted of Eric Hilgendorf, engineer Markus Maurer, professor at Braunschweig Technical University, traffic researcher Barbara Lenz from the German Aerospace Center, and Wiebke Zimmer from the Öko-Institut e.V..
Zimmer described the promotion of the rapid introduction of autonomous cars as inappropriate and entered an urgent appeal not to give the driverless car a higher priority than environmental protection in the societal debate. "We have climate change, we have serious pollution problems and we have the introduction of autonomous cars. What should be the political priority?" The autonomous car – a climate killer? Traffic expert Professor Barbara Lenz confirmed that driverless cars do not contribute to air quality abatement. She quoted a study that predicts the number of car journeys would actually increase by some 6 % following the widespread introduction of autonomous cars. Summing up, she pointed out that "The car is the German’s 'favorite child'". Today, as in the future, this is unlikely to change: Car transport is the first choice of people who have to travel longer distances. Lenz also believes that the autonomous car will in future cannibalize other modes of transport, such as commuting to work by rail or the bicycle ride to the supermarket. Owning a car automatically leads to it being used more than other means of transport. Just how much Germans like their four wheelers is illustrated by the fact that the number of car purchases constantly increases by half a million every year. Zimmer and Lenz did agree, however, that, despite all the forecasts, it was still impossible to estimate how high the acceptance of this new technology would actually be. 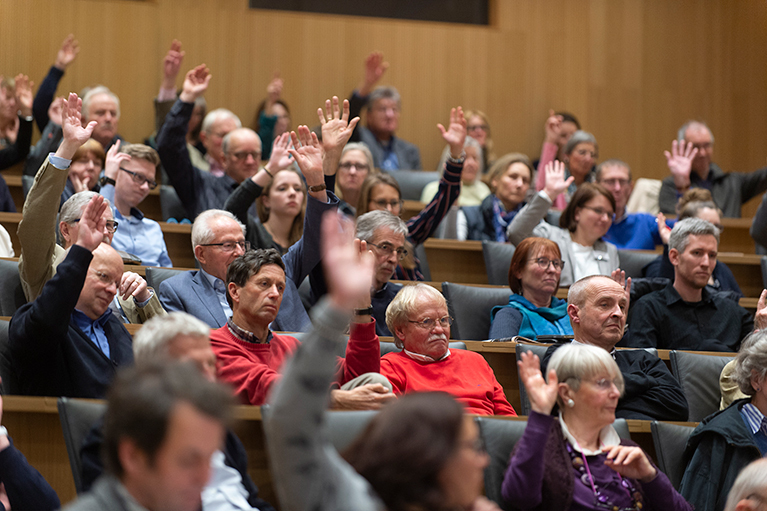 The fact that Hanover's citizens are less skeptical when it comes to digitized cars was shown by the questions put to the audience: At least half of all hands went up when asked who could imagine using an autonomous car themselves. In his contribution, Markus Maurer from the Institute for Control Engineering at the Technical University of Braunschweig picked up on the fact that by no means everyone would get into an autonomous car, even if it were available everywhere, and he pleaded for a more open debate culture. The engineering put into autonomous cars should come under more scrutiny, "since here the future is decided by technicians with no training in ethics, but who nevertheless make ethical decisions when programming the software". For car manufacturers, the lesson from the diesel scandal is not to supposedly accept legal rules and then bypass them through the back door in favor of profitability. Car manufacturers and their technicians should take a proactive approach to the risks raised by autonomous cars and engage in a transparent dialog with society about the actual capabilities and benefits of self-learning systems. Not by a long shot have all decisions already been made on how the vehicle should ideally behave in certain situations. "I’m curious to see what happens when the car starts negotiating with itself," said Maurer, citing an example of a tricky situation: If a van is parked in the middle of the road, the human driver would usually wait until the other lane was clear before overtaking it. But what if there is a ban on overtaking, and the autonomous car is programmed not to cross the unbroken line between the two lanes under any circumstances? Theoretically, the "driver" of the autonomous car would then be stuck indefinitely behind the van – causing an endless tail back into the bargain. Maurer explained that normal car traffic only functions smoothly because drivers are constantly weighing up the rules of the road against human pragmatism. An algorithm that could also make such decisions would have to do so within the individual context. According to Maurer, it is "an immensely difficult task to reproduce the real world mechanically". Taking ethical and societal considerations into the programming of digital applications right from the start is not just a worthwhile but also a most necessary research approach, and one that is supported by the Volkswagen Foundation's funding initiative "Artificial Intelligence and the Society of the Future". Funding is available for interdisciplinary research in the humanities and engineering sciences. he panel agreed that it will be a very long time before cars are able to act completely autonomously. Lawyer Hilgendorf called for the legal questions to be clarified before launching into the beginning of the autonomous driving age. The courts already have to decide today whether manufacturers of lane assistant systems, for instance, should be considered guilty of acting negligently if a car is steered back into the lane after the driver had passed out, for instance. The case in point: Near the town of Aschaffenburg, a 51-year-old driver had a stroke at the wheel, collapsed over the steering wheel and swerved onto the edge of the lane. The car, however, used the Lane Keeping Assist to automatically steer him back into the correct lane – with the result that the car fatally injured two pedestrians while the driver was sitting unconscious behind the wheel. Last year, the case was brought to the courts, which came to the conclusion that the car manufacturer bore no liability for the deaths of the two people at the roadside. According to the public prosecutor's office, the manufacturer had taken all precautions known at the time to prevent accidents and therefore could not be deemed to have acted negligently. German traffic law is a comprehensively regulated area of law, explained Professor Hilgendorf, and yet not in every case is it immediately obvious exactly who should be held responsible when an accident occurs. The issue of whether man or machine are "liable" is a tricky one that we will have to address increasingly often in future. The question is: Will the human driver be held responsible for traffic accidents caused by autonomous cars in future, or should responsibility be placed on the side of the self-learning machine, which – although it has been programmed basically in conformity with the law – in unforeseen circumstances might adapt to the negligent practices of other road users, endangering people of its own accord through a programmed room for maneuver in decision-making? It remains an intriguing debate.